Federal Finance Minister Jim Flaherty is tabling the 2014 budget this afternoon. Here are six things to watch for. Federal Finance Minister Jim Flaherty is tabling the 2014 budget this afternoon. It'll be his 10th budget for the federal Conservatives. Here are six things to watch for. Flaherty allowed at a news conference last week that there will be something more for Canadians to help bring prices north of the border closer to those in America. If last year's budget is a guide, he'll be dropping tariffs, import taxes on goods made outside Canada. The government dropped tariffs on sports equipment and baby clothes last year, though it ran into trouble when the tariff cuts didn't include everything promised. The NDP, for example, discovered the much-lauded cuts to tariffs on hockey gear didn't — at first — include helmets. Despite the promise, however, a tariff cut doesn't guarantee lower prices: it depends on whether retailers pass on the savings to customers. CBCNews.ca and CBC News Network will have complete coverage of Budget 2014 today, starting at 3 p.m. ET with an online live chat and streaming video of CBC News special pre-budget coverage with Power & Politics host Evan Solomon. Get full budget details and streaming video of the finance minister's speech and CBC News special coverage with Peter Mansbridge at 4 p.m. ET. Then stay with us for a live chat with finance experts and livestreaming post-budget coverage on Power & Politics, online and at CBC News Network. Canada's youth unemployment rate has consistently and stubbornly remained in the double digits. In this budget, Flaherty is expected to include money for internships and apprenticeships. In an interview with the CBC's Chris Hall, Flaherty said tackling youth unemployment is a priority. "And I agree with those who suggest there is a challenge for young people getting the first job, even [the] well-educated, well-skilled. So, we need to try to help, and we will," he said. Flaherty also said last week that the budget will include measures to prevent terrorist and organized crime groups from using charities to launder money. Flaherty said there are "some terrorist organizations, there are some organized crime organizations that launder money through charities, and make donations to charities," but didn't elaborate. The government has been accused of singling out environmental critics in order to silence them. The government says that isn't the case. Last year, Flaherty warned environmental charities that do political work to be cautious. Charities are only allowed to use 10 per cent of their resources on political advocacy, but are never allowed to be partisan. 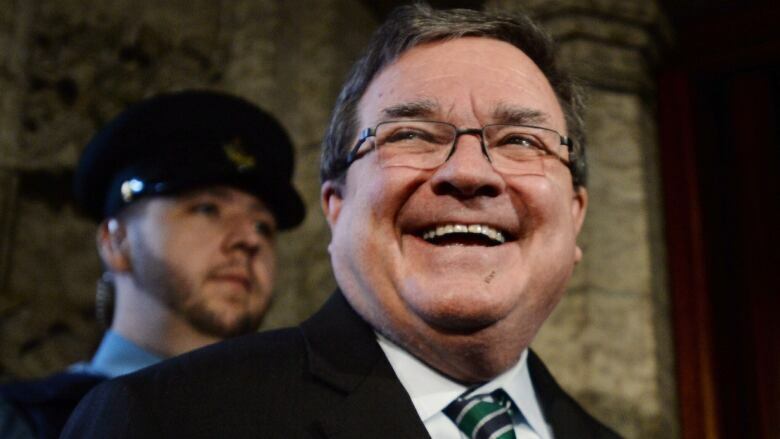 “If I were an environmental charity using charitable money, tax-receipted money for political purposes, I would be cautious," Flaherty said in December. Tuesday's federal budget will include money to extend or improve high-speed internet access to 280,000 households and businesses in rural and remote areas, the CBC's Alison Crawford reported over the weekend. The move, which was previewed in last fall's speech from the throne, is being pitched as part of the government's focus on consumers and also as part of its Economic Action Plan to stimulate economic growth and help small business, particularly in the North. It's a long-promised measure. The Conservatives say they've already brought broadband internet to 200,000 households that didn't have it before, although critics point out they also cut a community access program that provided funding to libraries to provide internet access. Last year, the government promised $53 billion over 10 years for infrastructure, including a $14.4-billion Building Canada Fund. This year's budget might include more details of where that money will go. The City of Toronto is expecting $660 million for a subway extension, for example, and officials in Ottawa are hoping for money to upgrade its sewer system so 225 million litres of sewage doesn't flow into the Ottawa River every year. The federal government will signal new support for Canadian automakers in a bid to keep car plants and the jobs they support in Canada, CBC News' Chris Hall reported late Monday. Chrysler is deep in negotiations with Ottawa and the Ontario government to kick in up to $450 million of a proposed $2-billion upgrade to its minivan plant in Windsor, Ont. Although the budget will not specifically mention Chrysler, multiple sources tell CBC News the budget will signal broad support for automakers as a key driver of the Canadian economy. That new commitment may be in part to placate the auto sector and its unions, which are strong opponents of a Canada-South Korea free trade deal. The auto industry fears such a the deal would lead to an influx of imports from the Asian country.